By installing solar panels on your roof, you not only generate electricity for your home, saving money on your electricity bill, but you'll get paid by the UK Government for generating renewable energy, and you'll get paid by your electricity supplier for extra energy you export to the national grid. The amount you are paid is called the Feed-in Tariff. From 1 July 2013 to 31 September 2013 the Feed-in Tariff is 14.90p per kWh of electricity generated by solar Photovoltaic (or PV) systems up to 4kW. Larger systems have a lower tariff.The Feed-in Tariff fell on 1 July 2013 from 15.44p/kWh and is expected to fall again on 1 October 2013. The direction your roof faces. Ideally your panels should face south, as most sunlight comes from this direction north of the equator. Some parts of the country receive more sun than others. Generally, the south of England is best, and there is less sun the further North you go. The best returns would come from a south-facing roof in southern England. The European Commission have provided a Map of Solar Energy Potential in the UK so you can see where you fit on the scale. Most companies require customer's to agree to keep the panels for around 25 years. You won't have to pay for insurance or maintenance of the panels, but if you plan to move home the new homeowner will have to keep the panels and sign up to the scheme. If your home is rated D for energy efficiency or worse, electricity generated will only pay out 6.85p per kWh. 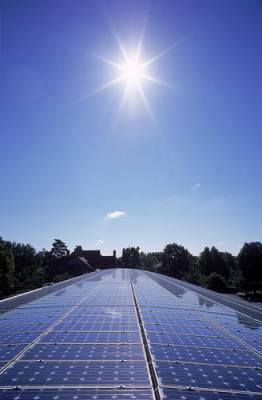 Installing a solar PV system can cost thousands of pounds. If you take out a loan in order to cover the costs, make sure you take the loan's interest into account when budgeting. The Energy Saving Trust states that the average size of solar panel installations is 3.5kW. A 3.5kW system at today's Feed-in Tariff rate will save £125 per year on electricity and generate £581 per year in income from generated and exported electricity. That means annual savings and income comes to around £688. The cost of installing this system is approximately £7,000.That means the average system will create enough savings or income to pay off the cost of installation after 10 or 11 years, and returns are paid out for 20 years.For comparison, a 3kW system at this rate will save £107 per year on electricity, generate £482 per year through income from generated electricity and exported excess electricity. That means annual savings and income comes to around £589.Assuming a similar set-up cost, this system would take 12 years to become profitable. Once you have received your Feed-in Tariff, it will increase over time with inflation, while newly awarded tariffs may be lower.According to the Energy Saving Trust, the Feed-in Tariff rates will continue to reduce in future but at some point the cost of installation will stop falling, so if you're considering solar panel installation, sooner is better than later.